Liverpool kick started their resurgence as a unit; emphatically dispatching the threat of Brendan Rodgers' former side Swansea by four goals to nil at Anfield. Anfield was a raucous, vibrant cauldron ahead of Brendan Rodgers' Liverpool against his former club Swansea - with a huge sense of anticipation among the home and away fans in attendance. The Reds knew a quick start was much needed. Young talent Raheem Sterling lead the Liverpool attack early on. He energetically sprinted down the left channel; isolating Fernandez, who conceded a corner for his troubles. The hosts came an inch close to opening the scoreline as Skrtel rammed a rocket header at goal but unfortunately for the centre back it fell straight into the grasp of Fabianksi. Liverpool really began to settle as they confidently moved the ball around well, with slickness and bad intentions in Swansea's perspective. Coutinho found himself in possession on the edge of the box, but The Brazilian's strike pummeled straight off Fabianski's gloves. Coutinho really showed his class as the 22-year old hooked a superb through ball over his own head that wobbled through to Sterling who unluckily got thwarted by Williams and Fernandez; visibly squeezing him out of room which was obviously the key to retrieving possession. Bony squirted a lovely pass to Taylor who hoicked a fantastic delivery into the box, but Dyer's header proved to be a let down as it lamely fell into Mignolet's grasp. The Reds' positive start brought them a well deserved goal. Moreno scorched down the left flank and fed Lallana on the inside who superbly threaded Henderson through on the right where the holding midfielder would cut back to Moreno who made no mistake in slotting home; handing Liverpool a well deserved lead. Terrific sequence of play. Shelvey zigzagged past several Liverpool defenders who failed to keep tabs on the scampering midfielder, however Garry Monk's talks of discipline with The Englishman didn't prove dividend as he outrageously elbowed Can in the jaw on his charging run into the box. Andre Marriner, however, was reluctant to penalize Shelvey. The half time whistle sounded and a sigh of relief echoed from Reds fans as Rodgers' men edged past a dismal Swansea in the first 45. Monk's men made an atrocious start to the second as goalkeeper Fabianski failed to clear a rushed backpass to him; enabling Lallana to energetically close the Swansea man down; whom provoked his run by carrying vulnerability on the ball. The new signing did so, and blocked Fabianski's terribly timed clearance that bounced off him and straight into an open goal. Seemingly, game over at that point. However, that stunningly wasn't to be. No sooner after Liverpool players concluded their celebrations, the visitors struck. Routeledge launched a dangerous ball into the box, but Sakho's power headed clearance fell to a charging Sigurdsson who slotted home from close range. Game on. The match really ignited, as Sterling would counter attack down the left in an attempt to put the game to bed. He switched to Henderson who made a great run down the right, and the holding midfielder launched in a phenomenal cross to Sterling who struck on his left, but agonizingly hit the post. Lallana would soon wrap the game up with some class play. Henderson initially fed Coutinho, who excellently threaded through to the goalscorer with a backheel and Lallana, on his left, breezed past one defender, sizzled the next, struck a beautifully timed strike into the bottom right hand corner. Sweet, sweet finish. The Reds put proceedings to bed with just under 20 minutes to go. Coutinho whipped in a teasing corner that Shelvey unwittingly glanced over Fabianski and into the back of his own goal. Terrible night for The Englishman. The final whistle blew, and another win for Liverpool. A thoroughly professional performance for them as The Reds ended 2014 on a high with a four goal hammering of Swansea. 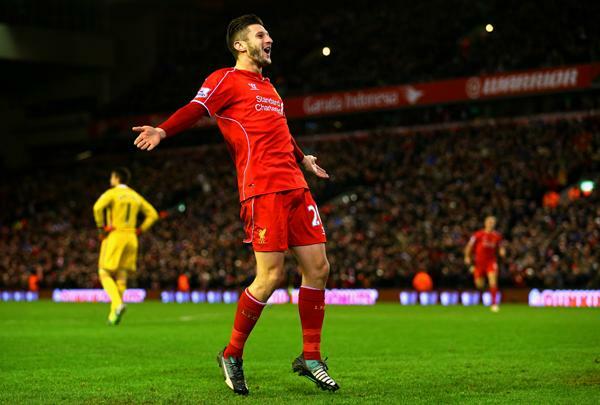 A complete match report for Liverpool vs. Swansea, contested in the Barclays Premier League on Monday 29 December 2014.